I'm strangely in-tune with the weather here lately. It's only just really starting to feel summery, and so am I. I've had some unpleasant stuff going on. Let's just say that teeth are icky and leave it at that. 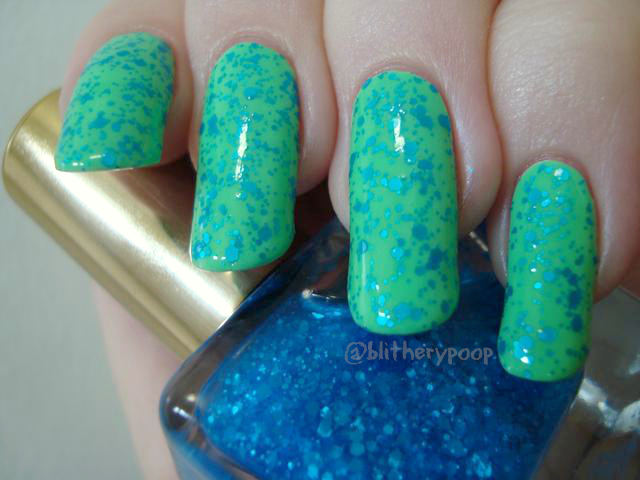 Whatever the reason, I'm only recently beginning to feel like wearing bright, summery colors on my nails. A couple of weeks ago I got a sudden urge to top everything bright with everything else bright...and now I've got a second batch to show you. 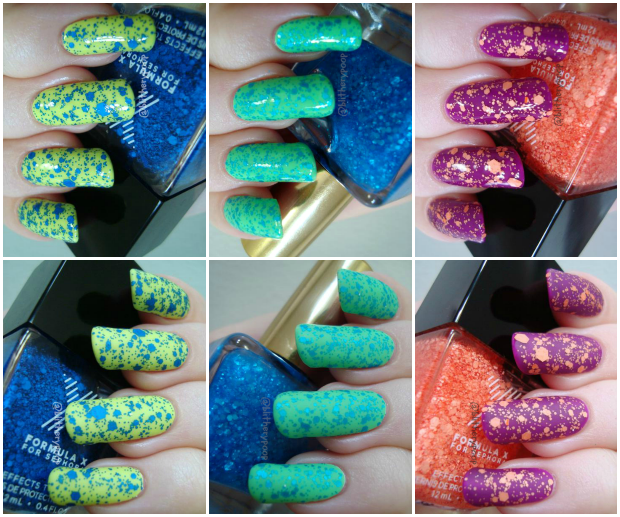 I topped yesterday's OPI Neons with a few more bright matte glitters. 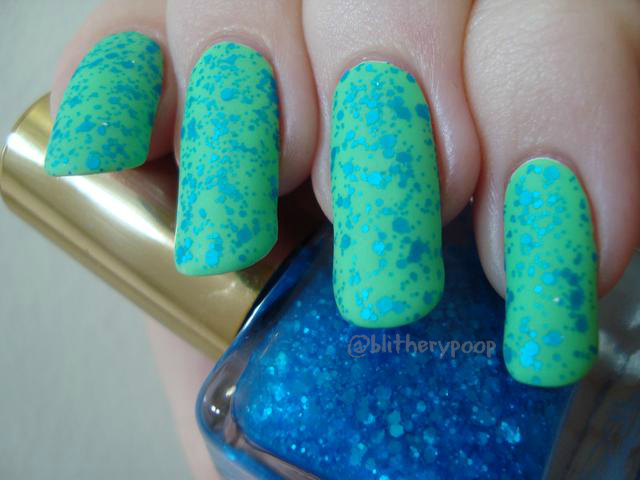 Formula X TNT has five sizes of blue hexagonal matte glitter in a clear base. This was another from that great Sephora in JCP clearance haul, but I spotted it at TJ Maxx on Sunday for $3.99 too. I've heard that Ross is getting these too. It's worth looking because they're terrific! I have five of the Xplosives glitters and I love them all. TNT applies just as well as the others, with minimal placing and dabbing needed. 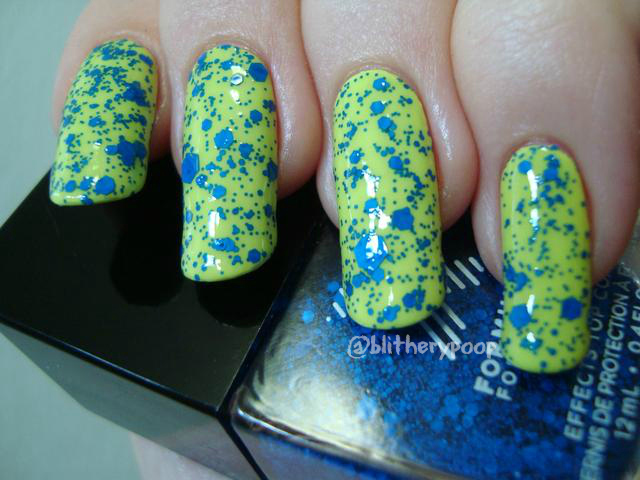 It is a little darker in person, but the contrast with the bright chartreuse base made it look lighter. Of course it looks even better matte! 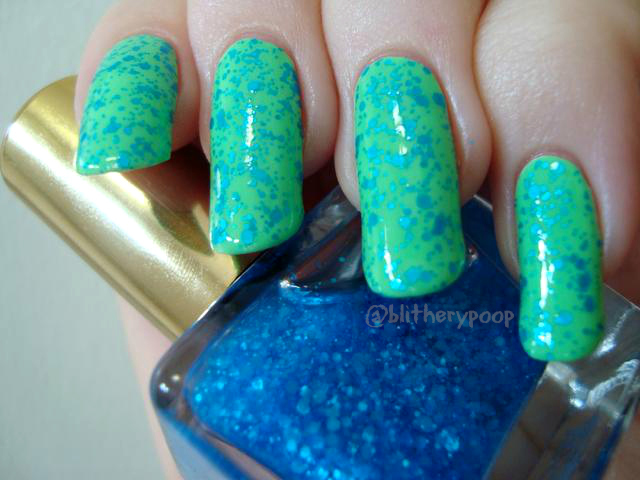 Urban Outfitters Blue Crushed Shell has four sizes of bright blue hexagonal matte glitter in a clear base. I tried, but this stuff just doesn't want to photograph well at all. It's quite bright in person, in a way that my camera didn't seem to understand. 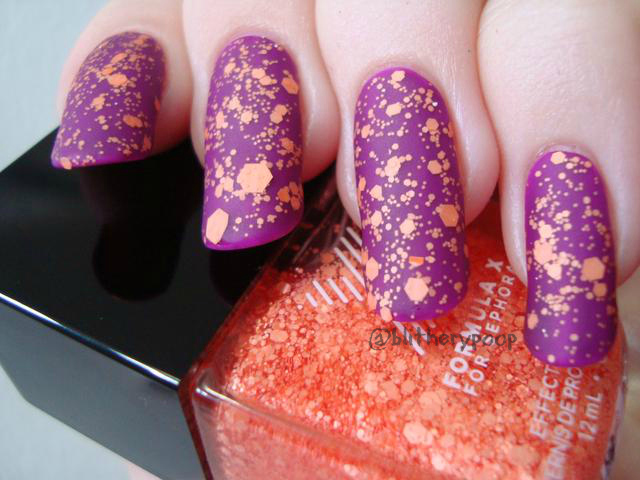 Both of the Crushed Shell glitters I've tried are terrific and well worth the 2/$8 price. There's a pink too, but...pink. Great application, minimal dabbing, all that good stuff. 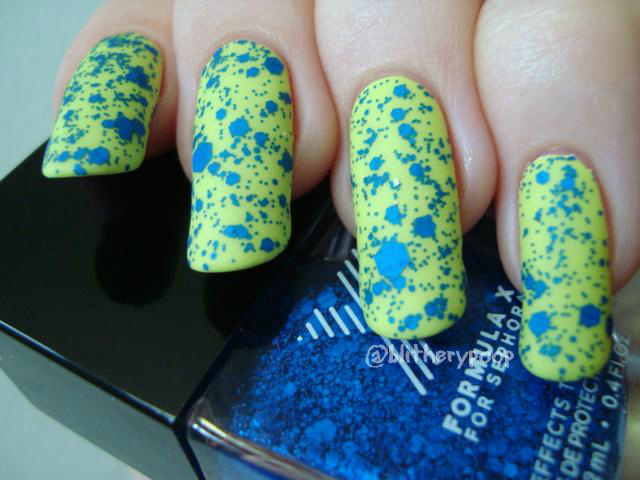 Matte top coat made this combo look insane in person and helped my camera a little bit too. 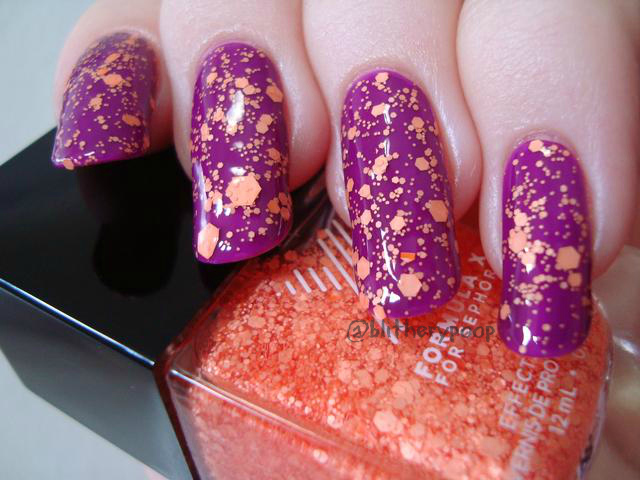 Formula X Firecracker has a clear base with five sizes of light orange matte hexagonal glitter. I initially wasn't sure about Firecracker, but I'm glad I got it. It makes me kick myself a little over the ones I didn't get. Oh well...maybe I'll be lucky and find a few more at TJ Maxx or Ross. Great application on this one, just like the other Xplosives. Bottom line: Yes, yes, and more yes! The Xplosives are worth tracking down at clearance stores and the Crushed Shell collection is available at Urban Outfitters. You know what's kinda sick though? This. Who are they kidding? ...aside from themselves. It's $10 on eBay and probably even cheaper on Storenvy.